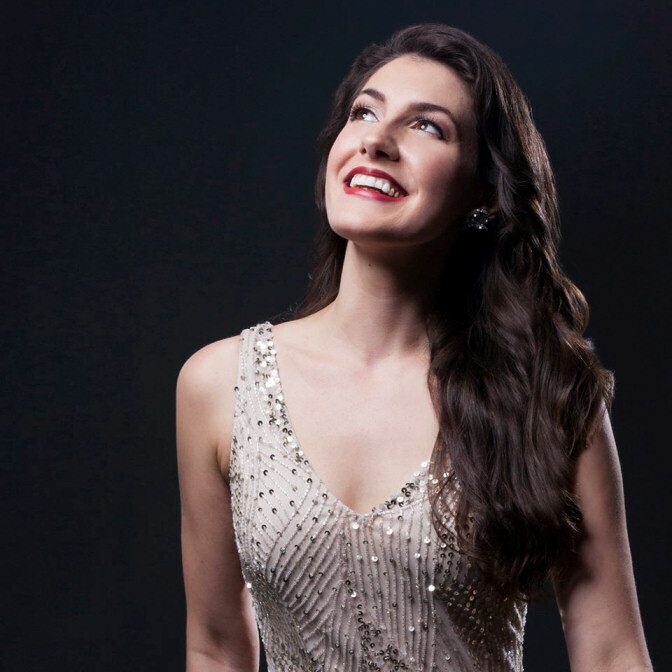 In her current show at 54 Below, “Stardust: A Night in the Cosmos,” Jennifer Sheehan gets lost in the stars, mostly in a good way. No fewer than sixteen full songs referring to the moon, planets, space exploration, and just plain old distant points of light in the sky show this exceptional singer and radiant personality off to great advantage. Her stellar set ranges widely, from the children’s nursery rhyme “Twinkle, Twinkle Little Star” (old French melody, lyrics by Jane Taylor) through familiar standards, with a twist, such as “Old Devil Moon” (Burton Lane, E.Y. Harburg) and “Lost in the Stars” (Kurt Weill, Maxwell Anderson), to somewhat more contemporary fare by Joni Mitchell (“Moon at the Window,” based on an 18th century Japanese Buddhist haiku); David Bowie (“Space Oddity”); Rupert Holmes (“Moonfall,” from The Mystery of Edwin Drood); and Pink Martini’s charming millennial swing revival “Hang On Little Tomato” (Patrick Abbey, China Forbes, Thomas M. Lauderdale). Some of the songs refer to the moon or stars only tangentially. Sheehan’s narrative, besides recounting her lifelong personal fascination with said cosmos, also draws on the words of writers ranging from Plato to Henry Wadsworth Longfellow to Alan Watts. Dorothy Parker contributed some uncharacteristically sentimental lyrics to the lovely “I Wished on the Moon” (music by Ralph Rainger). Another standout is “So Many Stars” (Sérgio Mendes, Marilyn and Alan Bergman); Bargonetti’s guitar work is especially compelling on this song. Sheehan’s finale is a convincing “What a Wonderful World” (George David Weiss, Bob Thiele). And her encore is “Stardust” (Hoagy Carmichael, Mitchell Parish), which commands renewed attention for Sheehan’s long a cappella introduction, with her instrumental backing only belatedly creeping in very subtly. Lacking a named director, Sheehan sometimes allows her narrative to drift into the weeds for too long. While her personal enthusiasm, dating from early childhood, for the night sky in all of its ramifications (mercifully excepting astrology) is palpable, it isn’t always contagious. Her memorization, even internalization, of outer space arcana is remarkable and even admirable. (But is a sound bite of the 1977 Voyager’s space probe to Jupiter’s electromagnetic field passing the planet Saturn really necessary or helpful to the cause?) If Sheehan shared just a little bit less of her spoken knowledge with her audience, and sang just a little bit more, this show would be truly heavenly.